You are currently browsing articles tagged Música entre vinos. Music and wine – what’s not to like? Yes it’s that time of the year again – when all the bodegas in Jumilla are alive with the sound of music! 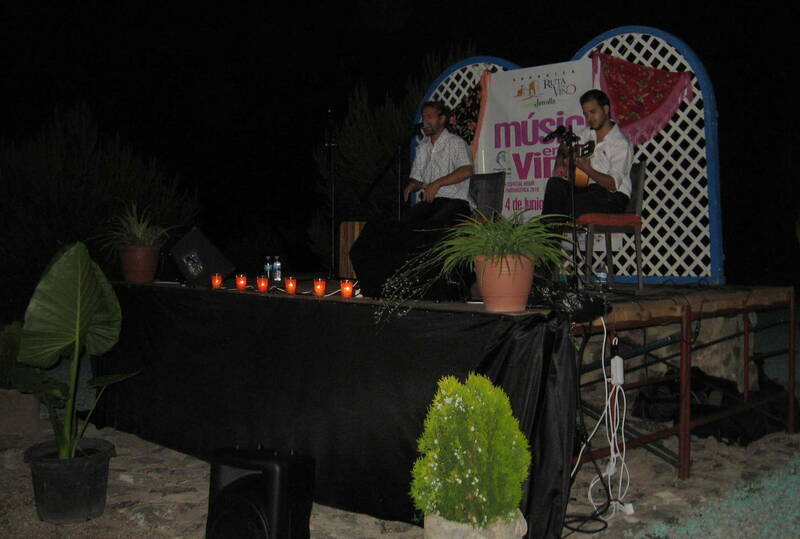 When we first moved to Jumilla we thought that the idea of listening to a concert in a bodega was really cool. Four years later and we haven’t changed our minds. 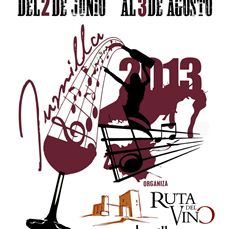 Starting on Saturday May 12 in Bodegas San Isidro, there will be a concert in Jumilla every weekend until 28 July. On the programme there is music to suit all tastes: a string quartet, a choir, pop rock, jazz, our favourite flamenco group Al Golpe and many more. Most events will be held on a Saturday evening or a Sunday lunchtime and will start with a tour of the bodega followed by the concert and, to round thing off in style, there will be a chance to sample some excellent wines accompanied by local dishes. The exception to this will be on Friday 3 June, where our favourite Vinotería Los Chilines will be hosting the concert. Chilin (aka José María) always organises great events, so we have already reserved our tickets and are looking forward to music from Cantos Jazz Fusión and the usual mouthwatering food, washed down with some of the best Jumilla wines. Because of the crisis the amount of sponsorship has gone down in recent years, which means the price of tickets has had to be increased. Having said that I still think that the ticket price of 20€ is a bargain, considering that you get to listen to great music, taste lots of Jumilla wines and sample delicious local food. I wonder how far £20 would go on a night out in London nowadays?! These events are always very popular, so I would advise you to reserve your tickets either by phone or by email before they sell out. The programme is copied below, but if you want more details or have any queries you can contact me via the Contact page on this website. So what is your favourite kind of music? Some people find that question easy to answer. My friend Wendy’s husband Con is a jazz fanatic, with too many albums for me to count them all: I’m not sure whether we are talking 100s here or even 1,000s! My father loved classical music and would sit listening to his records in the dining room whenever my brothers and I had “Top of the Pops” on in the living room. Showing my age now (!) - I still love listening to music from the 60s, plus some light classical music, in memory of my Dad. However, since moving to Spain, I have also got into flamenco in a big way. I don’t think it is a case of which music I prefer, it’s more a matter of what mood I am in, and I am sure that many other people feel the same way. I have pasted some links below to videos on youtube that were taken at the recent Música entre Vinos concerts, with music varying from flamenco to jazz via swing. Needless to say, I enjoyed all these concerts even though the music was very different. Even before you see the welcome sign to Jumilla, the Ciudad del Vino, it’s pretty obvious that Jumilla is a wine producing area by the numerous vineyards on either side of the road. There are olive groves, almond trees, orchards of peaches and pears as well, but it’s the vine that dominates the landscape. Wine has been produced in Jumilla since Roman times from which I gather – though history isn’t one of my strong subjects - that Jumillanos have been making wine for a very long time. When phylloxera devastated vineyards in France in the middle of the 19th century, there was a resulting boost to Spanish winemaking and particularly in Jumilla where the monastrell grapes were unaffected. French wine-making immigrants brought their expertise to the area, which was a turning point for Jumilla wines, even though they too were affected by phylloxera at a later date. Early exports of Jumilla wine were in barrels and, as they were taken by train to Alicante and shipped from there, the wine was designated as Alicante wine. The next important stage in the history of Jumilla wine therefore was on 22nd January 1966, when it was granted the right to have its own D.O. Currently there are 42 bodegas within the D.O. Jumilla and, contrary to rumours, John and I haven’t visited them all. At the time of writing our total is 13 – lucky for some! The creation of the Ruta del Vino Jumilla, which is certified as one of the Wine Routes of Spain, was an important step for wine tourism in Jumilla. Twelve bodegas, two wine shops, one specialist food and drink shop plus seven restaurants are amongst the associates, who all work hard at promoting Jumilla and its wine. Last year the Ruta del Vino won a special mention in the national awards for best enoturística initiative for its popular and successful Música entre Vinos events. Los Chilines vinoteria was also shortlisted, which didn’t surprise us after attending their many excellent winetasting events, including La Gran Cata, one of the year’s highlights, which we will be going to next week. Times are hard, so Jumilla isn’t resting on its laurels. One of its biggest export markets is the USA, helped no doubt by the fact that Robert Parker has given 90 points or more to many Jumilla wines over the last few years. 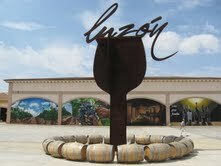 He has recognised that Jumilla wines are extraordinarily good value and commented on their superb price-quality ratio. Last year the main markets for Jumilla’s bottled wines were the UK, USA and Germany. However there are new markets out there and local bodegas are also looking to increase their exports to other countries such as Japan, Russia and Canada. In spite of the world-wide recession, over 8 million litres of wine were sold in 2010, with a slight increase in the amount of bottled wine, although figures for bulk wine were down. This year Jumilla celebrates its 40th Fiesta de la Vendimia, where wine flows from one of the fountains in the city centre, much wine is drunk by both Jumillanos and visitors, and on the last night lots of wine is thrown over the participants. Not surprisingly, John and I consider that a bit of a waste! So let’s raise our glasses to Jumilla wine – Salud! Why part 2½ you may ask? Well my post about last Saturday’s Música entre vinos should have been part 2, but I got carried away and named it Saturday Night Fever instead. I couldn’t decide between calling this post Música entre Vinos part 2 or part 3 so I decided to compromise. I am British after all, and we like to find a diplomatic solution where possible. So how did last night’s event in Bodegas Alceño go? How did it compare with the seven events in total that we had already attended this year? John rated it no 3, however I decided it was equal second: being diplomatic again. We expected the organisation to be good, which it was. We knew that we would enjoy the wines, which we did. Juan Miguel is meticulous about how his wines are stored and served so that you can enjoy them at their best, and he always delivers. As soon as we spotted the familiar figure of the boss of Casa Canales with his efficient staff, we were reassured that the food would be good too. We have enjoyed listening to the music of Jumilla Black Band in previous years, so we knew they wouldn’t disappoint. My only criticism is that I would have preferred them not to wear their trade-mark black clothes, as they don’t show up very well in my photos! Our friends John and Lesley have visitors so they decided to give this event a miss, making us the only “ingleses” there last night. Fortunately we didn’t need them to chauffeur us this time as Bodegas Alceño is within walking distance of our apartment. Officially the bodega’s name is Bodegas Pedro Lúis Martínez, however they are better known as Alceño, which is a far snappier title. The evening started well, as Casa Canales had already set out plates of savoury pastries and almonds, and soon we were enjoying a glass of vino blanco to wash them down with. We were outside, and it was a very warm evening, so we both appreciated the perfectly chilled wine. We were joined by some friendly Jumillanos, who soon took us under their wing. One of them hunted down a bottle of chilled rosado, which they told us was “fresco” and perfect for such a balmy night. A plate of jamón appeared, which they offered to me, however I declined and explained that I didn’t eat any type of meat. Seconds later one of the señoras caught the attention of a waitress who had a plate of cheese and purloined it for me. Once again there was a great atmosphere, helped by the swing music that we were listening to, with everybody tapping their feet or swaying in time to the music. The food kept coming with hardly a break, and in spite of our best efforts we were having to pass plates on to the next table where a group of young people were willing to help us out. As the temperature dropped, most people decided to taste the vino tinto, which was being served natural. For the benefit of readers living in the UK I would like to point out that, even though it was now after 11pm, cardigans and jackets were still superfluous. Instead of being hot, it was now pleasantly warm. Juan Miguel had a quick word when passing by, advising us that the Tinto Dulce 2010 was muy bien. It arrived just in time to accompany the desserts and chocolate - and he was right: it was indeed very good. As, of course, was the whole evening. How many fiestas are there on any one day? You would expect the answer to be one, however last weekend two different Fiestas were being celebrated in Jumilla: San Fermín, as discussed previously, plus San Cristóbal, the patron saint of all travellers including lorry drivers. The official days are different, but why restrict yourself to one day’s partying when you can have several days of celebrations? Exactly. The Fiestas de San Fermin ran from 7th to 10th July, whereas the Fiesta de San Cristóbal took place on Saturday 9th and Sunday 10th July. As honorary Jumillanos we feel it is our duty to support as many local events as possible, which made the weekend a rather frantic one, especially as we also have a duty to support Música entre Vinos, which meant we were committed to attending the event at Bodega Viña Campanero on Saturday night. Readers, it was hard but we did our best. Friday night was San Fermín night and Saturday night was Música entre Vinos, so what should we do for Sunday night? It had to be San Fermín again, as we knew Al Golpe was the closing act for this year’s Fiestas, but we needed to show a bit of solidarity with the lorry drivers, especially as one of our dog Lisa’s favourite walks is down the road and past the lorry park. The local niños come out in force every year to watch the lorries parade through the streets of Jumilla. I suspect that this may have something to do with the packets of corn snacks, sweets and toys that are thrown from the cabs to the waiting children! Even John and I went home on Saturday evening with a bag of goodies after watching (and listening to) the lorries. The tooting of horns seems to be a compulsary component of the parade, and when we covered our ears they just laughed at us. The parade on Sunday morning was a more musical affair, as this time the statue of San Cristóbal was carried from the lorry park to the Church of San Juan Bautista for a special mass, accompanied by the local band. After watching the morning parade we walked Lisa into town to buy the Sunday papers, then stopped for a cold drink on the way home. We managed to glimpse the Pasacalles for San Fermín as well, where the statue of San Fermín was carried from house to house, accompanied by another local band. Lisa was not impressed by the loud firewords that were being set off at regular intervals, so we decided to head home with her. Our timing was perfect, as the mass for San Cristóbal had finished, and we saw the procession arrive at the Monumento de los Camioneros with their offering of flowers. The Policia Local were on duty to stop the traffic on the main road and I was beckoned across by a police officer so that I could take photos. After such a busy morning we decided to relax during the afternoon – after all, we needed to save ourselves for the evening’s events. We had arranged to meet friends in Bar La Casa at 10pm, however we soon discovered that we needed a Plan B as the bar was closed, in spite of Cristina having told us they were going to be open all weekend! Apparently they were all exhausted after a busy weekend (! ), but luckily Bar Central, which is usually closed on Sundays, had decided to take advantage of so many potential customers and had opened. John and I set up a rota to go and check whether Al Golpe had started their performance. We knew what time they were due to start, but this is Spain, moreover it is Jumilla. Although Bar Central is on one side of the plaza where the stage had been set up, there was a children’s fairground in between, and the fairground was very noisy, with a combination of loud music and excited children. About half an hour later than advertised Al Golpe started their act, so we downed our drinks and finished off our tapas before heading outside. As always their performance was superb and the audience loved it, calling out “Bravo!” and “Guapos!” before chanting “Otras!”, after the final number had been performed. Al Golpe added a couple of extra songs before packing up, so everybody was happy. It was nearly one in the morning when we left, pausing only to watch the final firework display. Saturday night is party night in Jumilla – or it has been so far this month. 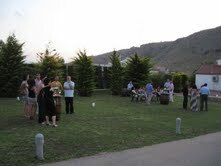 We thought that last week’s event at Bodegas JM Martínez Verdu would be hard to beat (what a party that was!) but Música entre Vinos at Bodegas Viña Campanero last night was great fun too. One advantage was the location, which is within walking distance of our apartment, so there was no rush to get there on time. I have to confess that this is one of my favourite bodegas: it is the smallest one in the area, so a tour doesn’t take much time; we like their wines too, which is always a bonus; it is very friendly – even our dog Lisa is made to feel welcome by Pedro and his father, though we had to leave her behind on Saturday night! We had assumed that the concert was being held indoors, as has happened in previous years, but when we arrived we discovered that everything had been set up outside. It had been a lovely hot day, and it was starting to become pleasantly cool when we arrived just after 8pm, so we had no objections to this change. One of the joys of living in Spain is that summer evenings aren’t cold, so we can enjoy lots of outdoor events. Even when we left the bodega after midnight, I didn’t need to wear the shawl I had taken. I went in search of a bottle of water, so that we could all have a cold drink while waiting for the wine to be served. Our friends Lesley and John had arrived before us, while Lesley’s son Nick and his friend Tracey weren’t due to arrive until 9pm. None of us was surprised when Nick and Tracey arrived to find that they hadn’t actually missed anything – have I mentioned the fact that punctuality isn’t a Jumillano characteristic? We all agreed that the wine was worth waiting for, though we couldn’t agree on our favourite. I really appreciated the chilled white and rosado wines on such a warm evening, but John soon moved onto his usual red wines and pronounced the Tinto Joven as his favourite wine. We expected the food to be good and we weren’t disappointed: I particularly enjoyed the tiny portions of tortilla, the cheeses and the churros, which were served in traditional style with hot chocolate at the end of the evening. An unexpected bonus was the arrival of our friends Jaqui and Melissa with a couple of our Spanish neighbours. plus we saw lots of other familiar faces. We heard a few other English voices, however I suspect that we were easily outnumbered by the Spanish community, as there aren’t that many British people (or indeed other foreigners) living in this area. The music was provided by Andrés Martínez and Cristóbal Cutillas, who played some brilliant riffs on his guitar. The infectious music soon had the appreciative audience nodding in time to the beat and rumour has it a couple of Brits were spotted dancing, along with several Spanish couples. There were loud calls of “Otras” at the end of the evening, and the duo happily obliged. We were glad that we didn’t have too far to go home, as we have another late night ahead of us. One of our favourite groups Al Golpe is playing tonight, to bring the Fiestas de San Fermín to a close, and they aren’t due to start performing until 22.30. It’s a good thing that we don’t have anything on the agenda for tomorrow morning! Música entre Vinos was a brilliantly conceived idea from the Ruta del Vino Jumilla and is now in its fourth season. Put simply, during the summer months a series of concerts are held in local Bodegas, where you can also taste wines from the Bodega accompanied by local dishes. We had already enjoyed five of the first six events (we applied too late for the sixth one!) and were looking forward to the other four that we have booked. We popped into Los Chilines wine shop for a word with José María on Friday. He told us that tickets were still available for the Música entre Vinos events at Bodegas Viña Campanero next weekend and Bodegas Pedro Luis Martinez the following weekend, however only a couple are left for the closing event at Bodegas Bleda on 30th July. This year’s events have proved extremely popular and most have sold out well in advance. Even more astonishing was the news that La Gran Cata, which is being held on 29th July, has already sold out. Apparently there were 400 applications for the 250 tickets – luckily we had reserved tickets last week for ourselves and our friends Lesley and John! On Saturday night we headed to Bodegas JM Martínez Verdú, hoping that the event would be as good as the one we attended there last year. It was rather worrying when we drove through a downpour, as we suspected that the concert was going to be held outside. We arrived to find our friend Fina looking anxiously at the sky. She reassured us that our four reserved tickets were there, while muttering to us that she was nervous about the weather. Fortunately the weather was on our side and we enjoyed a wonderful evening. I have to say that the whole event exceeded our expectations: it was very well organised; the wine flowed; the food was absolutely delicious; the music was from the superb Flamenco group Al Golpe and we enjoyed watching Flamenco dancers too – and finally there was a wonderful atmosphere with so many people having a good time. John, waiting with our friends Lesley and John, for the wine to appear! We enjoyed some tiny empanadas (savoury pasties), what appeared to be mini sausage rolls (though I gave them a miss as I don’t eat meat) and the most delicious seafood vol au vents I have ever tasted. I don’t know how many of the tiny vol au vents I ate, but every time they offered me another one I willingly accepted. Yummy! We then moved into the garden further down the road for the actual concert by Al Golpe. Three coach-loads of British residents from Torrevieja on the coast had ventured inland for this event. They had been persuaded to come along by their Spanish teacher Begonia, who coincidentally is teaching Spanish to Lesley’s son Nick, who has just moved to Los Alcazares. Once the concert started, the evening became very lively. 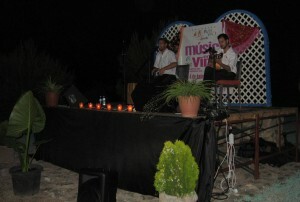 Al Golpe are a talented group of three young musicians from Jumilla. I will give a link to a video that I took at the concert, but believe me they sound even better live, with an appreciative Spanish (and English!) audience. To add to the experience there were a couple of lovely Flamenco dancers who, or so we were told, were the daughters of José María, the owner of the Bodega. While we were enjoying the concert, some good red wine was served (look out for Xenys, Xenysel or Calzás on the label, if you want to try their wines) and even more delicious food. We had to smile when we overheard an English woman saying “they are bringing round bread and jam!” Excuse me, Madam, it is a local delicacy of fried goat’s cheese topped with jam made from Monastrell grapes – and absolutely delicious. Plate after plate of jámon, cold meats, cheese and tapas were brought round and, just when we thought we were full, they produced desserts! Tiny dishes of lemon sorbet to refresh our palates were followed by arroz con leche, tarta moka and fresh fruit kebabs. We all agreed that this was the best event so far, but we are going to three more this month so I will be reporting back on them over the next couple of weeks. A typical day in Jumilla? I have decided to join the Ultimate Blog Challenge, which means trying to post on here every day in July – yep, that’s what makes it challenging! It occurred to me that if I was just blogging about my everyday life in Jumilla it might become a bit repetitive, so I started thinking about a typical day in Jumilla. What in fact would I be writing about? First thoughts are: walking the dog; talking to our Spanish neighbours; meeting friends for coffee; shopping; going out for wine and tapas; cooking dinner; reading; watching Spanish TV. Would these be interesting to other people? I guess it depends on where you live, as for John and me all these activities are normal, however if you live in the UK or in other countries - or even if you live in Spain but on the coast – you might be fascinated by my insights into our life in Spain. I certainly hope so! Of course you are unlikely to speak to Spanish neighbours on a regular basis or watch Spanish TV unless you too live in Spain, and going out for wine and tapas is more likely to be an occasional treat rather than a regular occurrence if you live in the UK. I will also be writing about some special events such as “Música entre Vinos”, which is an award-winning initiative from the Ruta del Vino Jumilla, and “La Gran Cata” at the end of the month. If you are going to follow me on this journey for the month of July, you might be interested in knowing a bit more about me, so that you can see what you are letting yourself in for……! After several years looking at property in Spain, my second husband John and I made the momentous decision to retire to the Spanish town of Jumilla, which is in a remote part of north-east Murcia. Our initial problems trying to buy an off-plan property mainly account for the “downs” referred to in the title of this category, and our experiences once we moved into our new apartment here in Jumilla mainly account for the “ups”. I wrote a book that chronicles our early adventures (follow the links on this website if you wish to buy it from Amazon!) and I am continuing our story through this blog. I hope that you will comment on my posts and in particular I would love to hear how your life differs from our new life in Spain. If you have any burning questions, please add them below and I will do my best to answer them.